By: Chester Whelks on 13/06/2013. …were he looking down on us from a safe distance, biding his time after his last ill conceived ‘Return’, then based on the current T-Shirt count, the answer is a resounding “YES” (Right, and for the last ten years, The Ramones are the most listened-to band in the world). After the ironically titled ‘Rise’ of the retiring Dark Knight, it stands to reason that Warner Bros. would look to their second biggest hitter to fill his sizeable boots. It’s depressing for those of us that have carried these characters with us into adulthood to think of it in these terms, but Friday’s release of ‘Man of Steel’ is, in the studio’s eyes at least, just a means of retaining Box Office dominance over those much coveted summer months. Ordinarily this wouldn’t bother me so much were it not for what this particular character represents. The Messianic parallels between Kal-El and Christ are now fairly ubiquitous, while the burning question over whether the Bat is the mask for the man, or the man the mask for the Bat, is a relatively new one that smoldered-on for 7 years sparking the imagination of a unprecedentedly large portion of the movie going public. Despite some downtime after the screaming neon and benippled Batsuits of the late 1990s, the Bat-Franchise still proved easier to resuscitate and more palatable to the public, while a procession of Hollywood’s brightest (Tim Burton, McG, Kevin Smith, Nicolas Cage among others) charged with the task of resurrecting Superman , couldn’t find the necessary tone to get the ill fated ‘Superman Lives’ project off the ground. A little over a year after Batman Began (again), the suitably reverent, but ultimately lacklustre ‘Superman Returns’ (whose Lois Lane penned ‘Why The World Doesn’t Need Superman’ I borrowed the idea of this Op Ed from) landed Bryan Singer with the unenviable task of finding a place for Superman in a post 9/11 paradigm, which he chose to callously circumnavigate with a pre-title sequence excuse saying he had been visiting the location of a Planet thought to have been destroyed shortly after his birth over 30 years previously. Exactly what he hoped to find other than fragments of this long dead world, incidentally the only known substance in the Universe that can kill him, is unclear. Ultimately the film seemed to bolster the argument made in Lois’s Pulitzer Prize winning article, and the elephantine mood in the room, proved too heavy for Superman to lift – no doubt not helped by breaking his self-imposed exile by displaying his aptitude at halting renegade Jumbo Jets in midair. Superman Returns: This just about sums it up. …an Atlas that would never shrug. The spandex-in-Manhattan ‘Man of Steel’ of modern memory imagined by Mario Puzo and realized by Richard Donner managed to reaffirm the incandescence of his legend (when the United States’ ethical integrity had never looked more suspect) in the aftermath of the Vietnam War and Watergate scandal. Superman somehow thrived in Seventies America, played – with all the goofiness of unabashed underpants and purity of heart – with a straight face, save for the odd wink shot in the direction of the fourth wall by Christopher Reeve’s masterful comic/pathos portrayal of a Clark Kent out of his depth among (but ultimately showing-up) the Objectivist denizens of Metropolis. Life prophesying art, prophesying the future: Christopher Reeve meets Ronald Reagan in 1983 at a reception and picnic in honor of the Special Olympics program. In 1987, after The Challenger Shuttle had disintegrated into absurd smoke plumes clamoring heavenward, the originally successful but chronologically corrosive run of four films came to an ignominious end with an admirable Christopher Reeve-written final idea centering around a Superman whose concerns were now decidedly more global, seeking to rid the world of Nuclear Weapons, but was poorly funded and failed even to recoup its paltry cost. Christopher Reeve hung-up his cape and that autumn flew to Santiago, Chile to save 77 actors earmarked for execution by evil Dictator General Augusto Pinochet. A year earlier, the tide of disenchantment with the character had been heralded in Frank Miller’s monolithic ‘Dark Knight Returns’, where Superman doesn’t so much hold the world aloft, as to ransom. Miller envisions a future Superman whose blind adherence to the latter of his famous three ideals sees him as an aging Reagan’s Right Hand. In the climax of the fourth and final book, 1986’s hypothetical ‘World’s Finest’ future-reunion ends with the revolutionary Batman outguiling a Man of Steel sent by the Government to silence him. Weakening him with synthesized Kryptonite, Batman subjects Superman to an unprecedented drubbing. Our burgeoning internal cynic, exhilarated, cheered the Dark Knight-on. ― ‘The Dark Knight Returns’ Frank Miller 1986. …at least, until this week? In the final installment of Christopher Nolan’s series, a physically faltering Batman transcends his Legend, becoming a symbol to inspire the fight-back of the Everyman against a seemingly unassailable occupying force. Cashing-in on the integrity its predecessors had fostered ‘The Dark Knight Rises’, while phenomenally successful in monetary terms, cultured an underlying backlash among many acolytes who incongruously took the film to task for plot holes no bigger or plentiful than present in its previous installments, and most ironic of all, decrying as risible the voice acting of Tom Hardy’s antagonist Bane - something they had chosen to overlook in the portrayal of their hero for the previous 294 minutes of Trilogy. Not only had the rot begun to set-in among devotees, but of course in Aurora, Colorado, something a little too ‘Batman’ happened. Before the year was out, the United States would be subjected to even more trauma in the wake of this particular hero’s on-screen swan song, incidences of such a horrific and cataclysmic stature as to even make me question my ability to detail them in the context of something superficially so trivial. In 1992, it was felt the world was taking him for granted, and he was ‘killed’ by the writers, after a boardroom joke used in lieu of any new ideas slowly gained weight. In 1995, when Christopher Reeve shattered his first and second vertebrae, our physical touchstone for Superman was incongruously broken, and the character would never really soar again despite repeated efforts, suggesting our readiness to ‘believe a man can fly’ had been permanently compromised. One person whose belief was not shaken however, was Reeve himself. 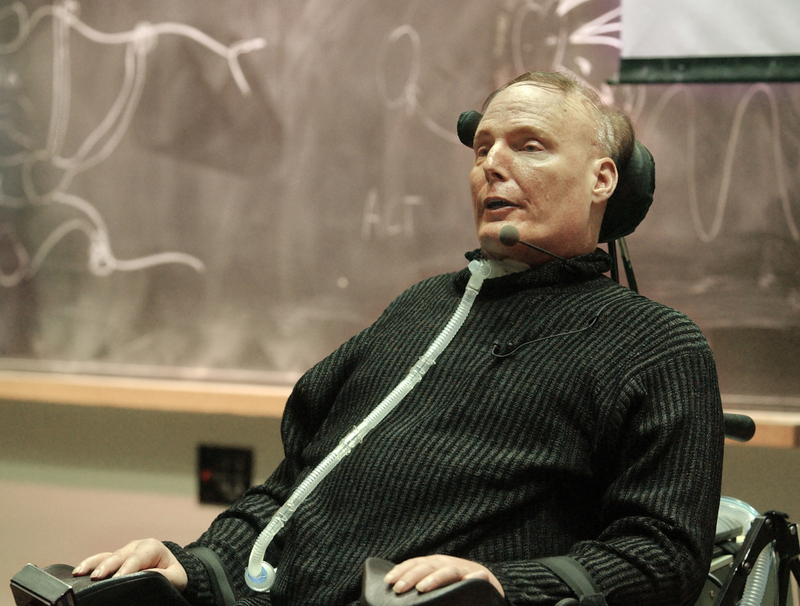 Having far surpassed the physical limitations Doctors had originally set out for him, Reeve made significant progress both personally, and on behalf of the silent few with whom he shared a common bond, but ultimately succumbed to complications related to something as innocuous as a bedsore in 2004. ―The Simpsons, ‘She of Little Faith’ S13 E06. We’ve vicariously seen countless die on live TV, obscured behind the enormity of grotesque spectacle and smuggled into our subconscious via deadpan conjecture and insinuation. Desensitized by unimpeded tsunamis, hurricanes, floods, massacres, genocide, lies and subterfuge, weakened by the Kryptonite of Real Life, we’ve subconsciously needed Superman so much, it’s possible that it perhaps hurt too much to want him knowing he would never be forthcoming, and so have rejected the frivolity of his myth. His beatdown at the hands of an aged Batman, was a metaphor for a man weathered by the harsh realities of life, facing his own mortality, and not only rejecting God but ‘testifying’ his ‘Death’ with the extremes of his being, the limits of his mental and physical abilities. Half mad and syphilitic, Nietzsche flinches in his stare-down with ‘The Void’. While perhaps not the Übermensch/Overman as screamed-for by Nietzsche, Superman is, at his enduring core, as pure a distillation of idealized Humanity as popular culture can muster, a crystallized symbol of our predisposition to do Good, the Super-Ego made flesh, and the only non-denominational example for the common man that comes anywhere close to guiding us toward that ideal. Voltaire said ‘If God didn’t exist it would be necessary to invent him’. I agree, if only so Nietzsche could kill Him. While I personally don’t believe in God (if He did exist, the sycophantic conformity to the tenets of His doctrine, adhered-to in the selfish pursuance of everlasting life and happiness would surely be one of his dickish tricks to dupe you into Hell), something approaching the concept of Him will continue to be necessary as long as Man can’t be trusted not to shoot-up their school because they nihilistically view their classmates as NPCs and solipsistically believe any actions prior to the end of their own lives have no consequence. The only thing as annoying as a microscopic life form fervently proclaiming the existence of God is its arrogant dismissal of the possibility. As prodigious as a flea is at leaping, it has neither the nous nor right to opine on the sky. We created a God in our own image, who has stayed with us through the ages. This time round it has been entrusted, under the tutelage of Christopher Nolan, to Zack Snyder, a director with an enviable track record for bringing an aesthetically pleasing interpretation of the illustrated page to the Big Screen, while often criticized for overlooking the subtext of their narrative. If Nolan and Snyder fail to redefine him appropriately this time, it may be indicative of certain irrevocable societal changes having rendered Superman obsolete, rather than just their professional ineptitude. Nietzsche declared God dead, and posited man’s rebirth as ‘the Superman’, and the concept was deftly illustrated in a modern context by Clarke & Kubrick in ‘2001: A Space Odyssey’ (which aptly enough brings to mind the similarities between John Williams’ ‘Also Sprach Zarathustra’-echoing Superman score) which unfortunately still baffles a great many, to whom this nearly 45 year old film seems little more than a psychedelically-ending, gallant technical achievement. While it’s perhaps a big ask for such popcorn fodder, and inconceivable that those involved in anyway approach the talent of the aforementioned, this material is deserving of no less an effort. The sunlight shafts through tempestuous clouds of the increasingly impressive trailers, and now incoming reports from those that have seen the completed piece, suggest that Zack Snyder’s ‘Man of Steel’ is delivering the Superman movie we’ve long deserved, but it remains to be seen whether it caters to audiences that want to see him ‘punch stuff’ or be thrilled viscerally while being spoken-to on an emotional level about how super a human can be. I’m eager to see if, however inadvertently, there are any ‘Day The Earth Stood Still’ comparisons to his ‘surrender’ to the Military, how they handle the question of his culpability in bringing catastrophe to American soil in the form of General Zod’s retribution for the ‘sins’ of his father, and how the ‘Truth, Justice, and American Way’ of this incarnation’s ethical anchor relate to, say, the motivations of Edward Snowden and Bradley Manning. Expectations able to leap tall buildings in a single bound? Perhaps. In ‘Kill Bill: Vol .2’ Quentin Tarantino vicariously suggests that Clark Kent is Kal-El’s criticism of mankind – an interesting layer to apply to his psyche, and a question worthy of being woven into the character’s mythology which may inadvertently wind its way in there yet. The current truth on the matter is simply that any enduring belief in Superman is self-criticism enough. Should we need him at all, as something to aspire-to, is an indication of where our race is psychologically. When we no longer need him at all, it’ll be because we’ve either found our way or lost it completely. As long as we continue to self-criticize, we’ll always explore the limits of what we could be, always be looking for the light to find our way. One Response to Does the World Want Superman?